Are Korean Hospitals Ready for Medical Tourism? Last week, Melissa Lowe, an American, was with a bored expression leafing through an English newspaper in the waiting room of the foreigners' clinic of a university hospital in Seoul. Since arriving on time for her 9 a.m. appointment, she had been waiting for about two hours, because the hospital staff told her to wait. "Because I'm a patient, I have to be patient," she said. The hospital has no doctor in charge of foreign patients, so three nurses who can speak English handle foreign patients' registration, give them directions, and even provide translation services for them if necessary during medical examination and treatment. It will become possible for hospitals to accept foreign patients for profit-making purposes in May after the passage of a revised medial law in January. 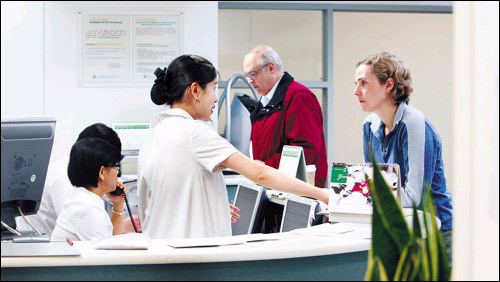 The government plans to attract 100,000 foreign patients by 2010. But are we ready to accept them? A nurse at Yonsei Severance Hospital speaks to a foreign patient. Last month, the Korean Medical Association conducted a survey of 10 hospitals out of 44 largest hospitals across the country, which are bent on attracting foreign patients, including Seoul Asan Hospital and Samsung Medical Center. It showed that only four of them have assigned doctors to handle foreign patients. Yonsei Severance Hospital is the only hospital in the country that has obtained the Joint Commission International (JCI) Accreditation, the sole international standard in the medical service sector. The WHO recommends "medical tourists" use hospitals that have obtained JCI accreditation. There are twelve of them in Singapore, six in India and four in Thailand. The government estimates that about 25,000 foreign patients used Korean hospitals last year. Most of them were here on a C3 or short-stay tourist visa that allows them to stay in the country for up to three months. But some of have to stay for more than a year to receive treatment for cancer or cardiac diseases. The Justice Ministry in April last year added "medical treatment" to the category of the G1 visa (other than diplomatic, tourist and work visas). But almost no foreigners have applied for such a visa so far.